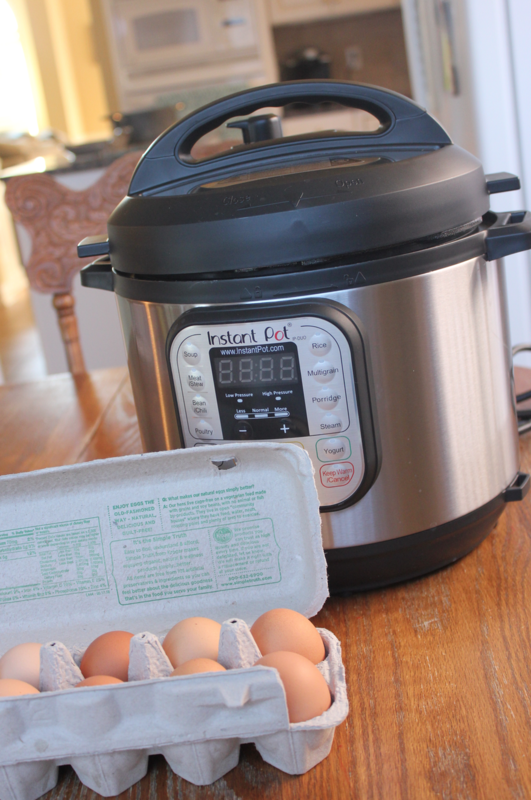 I bought an Instant Pot during the amazing Black Friday sale when the 7-in-1 Instant Pot was marked down to just $69! But when I got it and saw all of the buttons on it, I got scared. People had told me that this was a MUST HAVE appliance and after enough people told me I really, really needed to buy it, I finally caved. But then I regretted the decision. Because it felt overwhelming. You see, I’d never used a Pressure Cooker before… ever. And I was completely unfamiliar with Pressure Cooking. So I worried that I would blow something up trying to use it. It sat in the box until a few weeks ago, when I got brave and decided if I didn’t ever get it out of the box, I would never actually find out whether it was worth using or not. 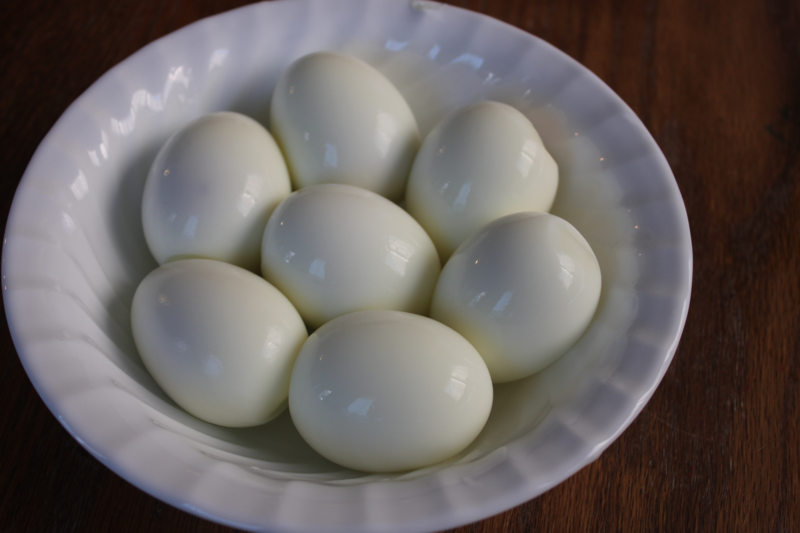 Many people had suggested starting with making Hard Boiled Eggs, because they are so easy to make and “almost impossible to mess up” I was told. 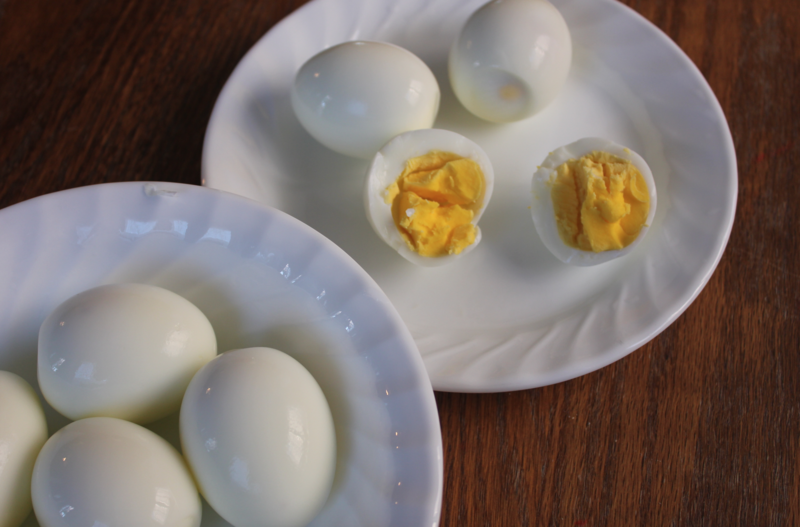 I’ve made hard boiled eggs probably at least a thousand times in my lifetime, if not more. So I figured they were a good recipe to start with. However, because I knew that I needed all the hand-holding I could get, I decided to hop on Facebook Live while I was attempting the recipe. Oh my! I am SO glad I did because, without all the help from my Facebook followers, I may have blown something up or burned myself… or at least have ruined the batch of eggs! The first time of using it was quite the adventure. But once I had done it, I felt so empowered. And it was a LOT easier the next time around. I am quickly falling in love with my Instant Pot. I love that I can cook so many different things in it so quickly. I love that I can put the ingredients in it and set the timer and then just leave it — instead of having to watch the stove, wait for the water to boil, and/or make sure the water doesn’t boil over. 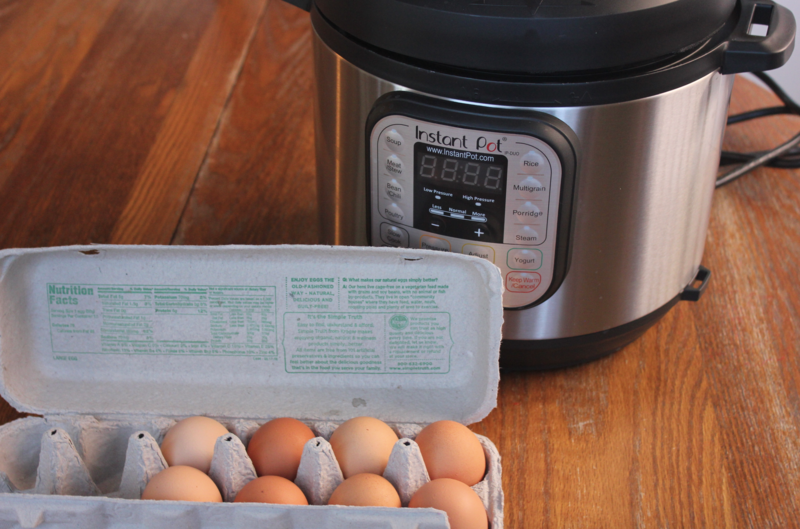 I’ve just barely scratched the surface of the world of Instant Pots and I am starting to clearly understand why people are such raving fans of this appliance! There’s so much it can do — and it makes eating at home and getting dinner on the table so much easier! There are many, many bloggers out there who are sharing incredible Instant Pot recipes. However, I knew there are some of you who haven’t yet gotten your Instant Pot out of the box and you are feeling scared, just like I was. So I thought it would be fun to share some very beginning Instant Pot recipes on my blog over the next few months as I learn how to use my Instant Pot. My hope is that these will inspire you to not let your Instant Pot sit in the box any longer! Get it out and start using it — you’ll be so glad you did! Pour one cup water into the removeable pot (that’s the metal pot shown in the photo above). 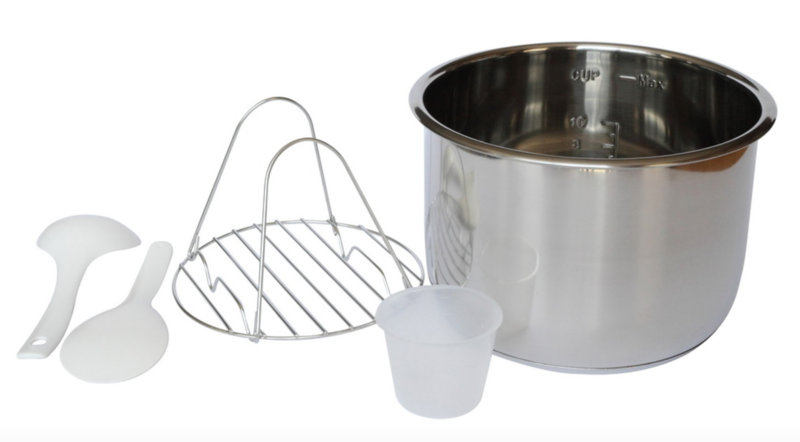 Put the wire rack (shown in the photo above) into the removeable pot. Put the number of eggs you want to boil on the wire rack. Plug your Instant Pot in. Turn it on and press MANUAL. Adjust the + button to 5 (for 5 minutes). It will take about 5 minutes for the Instant Pot to heat up. It will start making hissing noises. Don’t be alarmed. Once it is heated up, it will start counting down from 5 minutes down to zero. Once it is at zero on the countdown, wait 5 minutes to let the pressure naturally release. Then, use an oven mitt to turn the vent lock to venting (so that it’s open). VERY IMPORTANT: This will shoot out steam. A lot of hot steam. This is releasing the pressure. Make sure you have on an oven mitt. Make sure there isn’t a cupboard or anything above your Instant Pot that all the steam is going to shoot up to. And KEEP YOUR FACE AND HANDS AWAY FROM THE VENT when you are turning it. It is HOT! Let the steam fully release (the floating valve will drop down when it’s released). 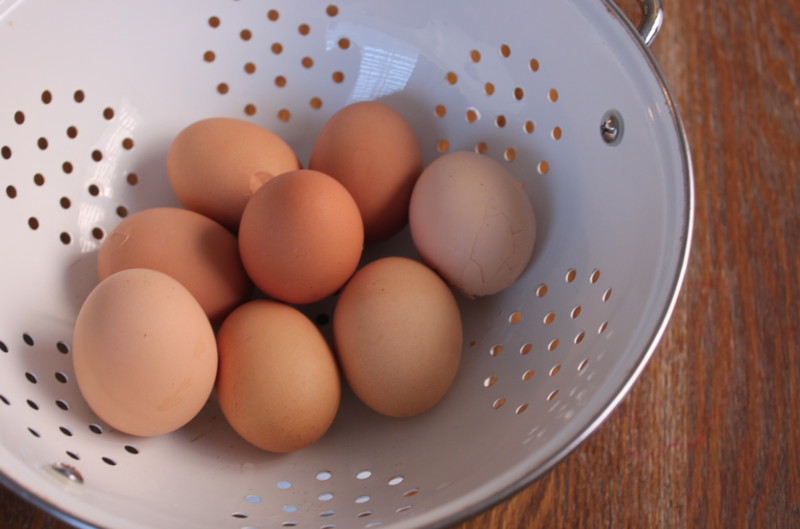 Remove the eggs with tongs and put them in an ice bath for a few minutes. Or, you can put them in a strainer and run some cold water over them and let them cool. Peel the eggs and enjoy! The peel will fall right off and the eggs will be beautifully cooked. Okay, I know that sounds like a lot of steps. 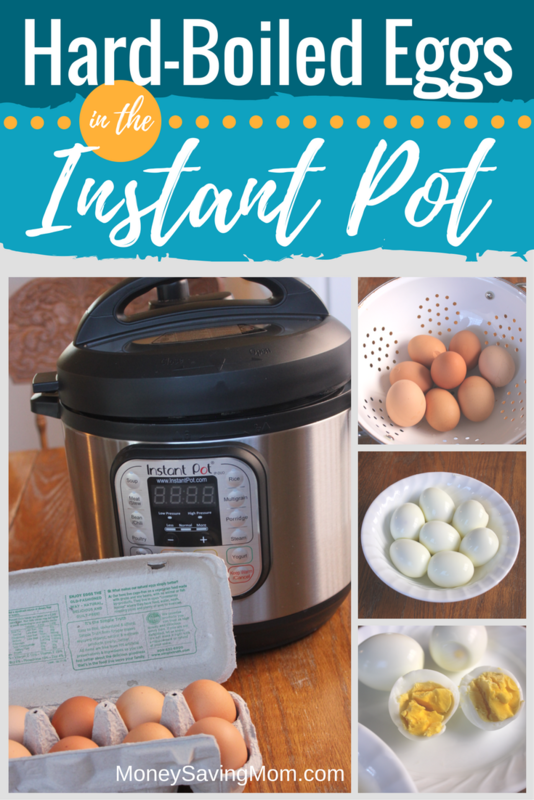 But trust me on this, after you’ve used your Instant Pot one time, it will be so much easier. I promise! 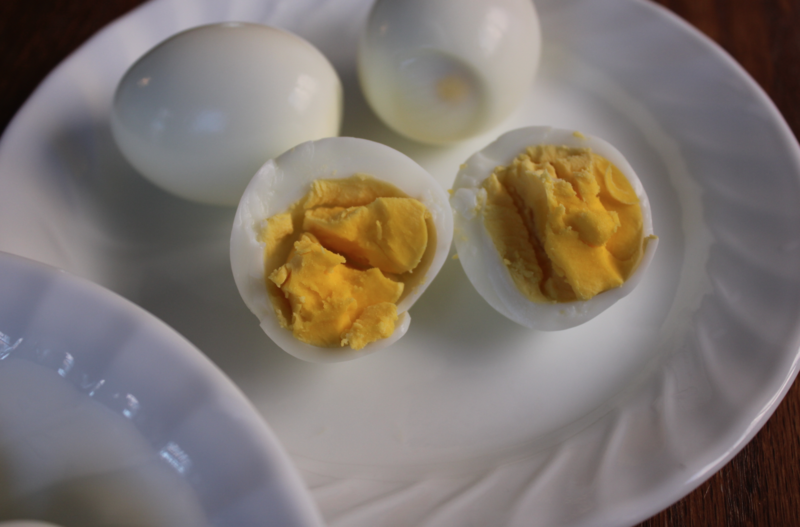 So get brave, get it out of the box, and make some amazing Hard Boiled Eggs! What are YOUR favorite things to make in the Instant Pot? I’d love to hear! Looking for more? Read more posts about Instant Pot Recipes. I LOVE my Instant Pot! I also bought mine on Black Friday, but from the day I received it, “Mrs. Potmore” didn’t get a “day off” for almost 3 weeks! Months later, I still use it most days. I’ve made lots of different meals, cheesecake, rice, potatoes, etc., but one thing that had a real WOW factor was the recipe for beef and broccoli. It is SO good (I served it with brown rice)! I’ve also used the sauce recipe for chicken, too–subbing chicken broth for the beef broth. I look forward to seeing you post some of your IP creations! I agree – it was super intimidating at first but i’ve used it a LOT since Black Friday and just love the convenience. My favorite thing is that I don’t have to plan ahead and thaw my ingredients before cooking. Not to mention bone broth – I get better results with two hours in the instant pot than three days in a slow cooker! My sweet whippet Olivia has congestive heart failure, and she gets a hard boiled egg every day per the vet to keep her phosphorous levels up…so I’ll be trying this on a fresh batch tomorrow! I feel like there are SO many, many benefits I’m going to uncover as I’m learning how to use it and experimenting with it! Thank you! I just bought an instant pot about a week ago and haven’t opened it yet, this is just perfect. I ordered mine from target.com because they had a deal with in-store pickup, but it looks like they no longer have that discount. I also saw them on Amazon and Walmart.com. Steel cut oatmeal! 1 cup oats to 3 cups liquid (I like almond milk). Add whatever flavorings. My family likes cinnamon raisin. High pressure for 5 minutes. Let it slowly decompress. Takes literally 1 minute of work and done in about a half hour. I make this several times a week for breakfast. Love mine. I have boiled eggs, baked sweet potatoes, roasted potatoes, made yogurt, etc. in mine. I hadn’t the opportunity to review one a year ago for an Amazon seller. I too have (still have ) the fear over the pressure build up and release. I have used it a few times for cooking in a pinch with time crunches but by the time it pressurizes (a lot longer than 5 mins for fuller pots of soup etc) and then depressurizes enough to safely open, I felt like I am saving very little time. I don’t have one but had to chuckle about the time saved making boiled eggs. Doesn’t it usually take about 15 minutes to make boiled eggs on the stove? So the time is about the same. I like some of the other suggested uses though. The one benefit of using the Instant Pot, though, is that the egg shells peel MUCH easier + you don’t have to worry about the water boiling over or watching an boiling pot on the stove. You can just turn the timer on the Instant Pot and leave it. Yes, I have forgot my eggs and have burned up my pans. The official Instant Pot Facebook group has helped me so much! My favorite thing to make is pasta (no watching the noodles anymore) and the fact it is one pot cooking. I also make frozen chicken breasts for my husband to take to work. This Mac and cheese is also a favorite- https://delishably.com/grains/best-pressure-cooker-recipe-ever. Ours more than paid for itself first trimester of this pregnancy when I couldn’t stand to smell food in the crockpot or think about food more than an hour or so before dinner. Depending on the recipe, I agree that it doesn’t necessarily save time due to the warm up and the waiting for pressure to go down, BUT with two kids (soon to be three) four and under who always go crazy during dinner making time, the no watching cooking really helps. I am excited for these posts. I have been to intimidated to even order one. Ok, I’m totally afraid of my instant pot too. I’ve only done chicken and rice (separately) and I don’t go anywhere while it’s on for fear it will blow up my kitchen. It’s good to know I’m not alone in this. 🙂 I boil 36 eggs every week on the stove and it takes what feels like forever sometimes. Do you think if I put all 36 eggs in there for 5 min they would cook? Maybe I’ll be brave and try it next week. 5 min vs. almost 30 min start to finish sounds lovely! You might want to try with a smaller amount at first. I don’t know if you can stack them but then again I am new to Instant Pot cooking. I was able to fit 9 in my Instant Pot without stacking. They came out amazing. I would be interested to know if you can stack them though. I stack them while cooking. I don’t even bother with the trivet. I put in however much it holds, almost to the top. It is probably 36 eggs. It cooks for the same amount of time. My problem is that I keep forgetting about the 5 minutes time for the natural release, so by the time I remember, sometimes 10 or 15 minutes have passed! It’s still good and easy to peel, but it does create the greenish gray around the yolk. I cooked 18 eggs in my IP last weekend. I used the 7-7-7 method. Seven minutes on high pressure, seven minutes natural pressure release, and 7 minutes (at least) in a bowl of ice water. 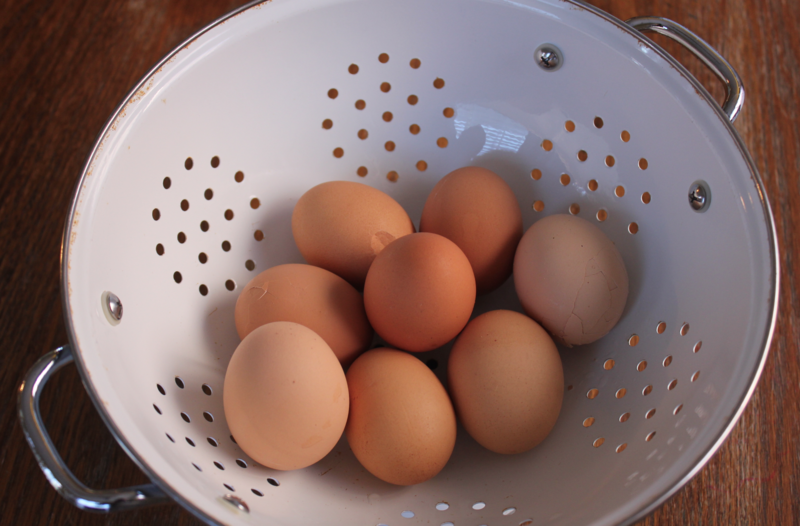 Our eggs are fresh from our chickens and they are usually very hard to peel. These were perfect. My freezer broke and I cooked 8 lbs of beef in my pot (I have an 8gt). 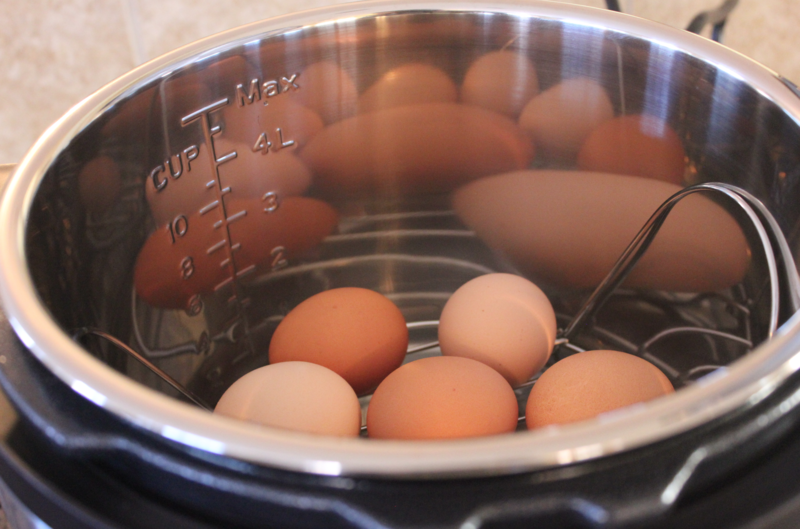 It can handle large amounts, just make sure the eggs don’t go over that max line. You don’t need to cook it longer either. It took my cooker 20 total to cook my beef. My husband proclaimed that the pot saved us, as we cooked many 8 lb. batches in it to cook all our ground beef that had thawed. Give it a t r y you’ll love it too! I love being able to cook dried beans in under an hour with no soaking. I also like the convenience of one pot meals, like mac and cheese and pasta with Italian sausage and red sauce. It’s also great to do something like pulled pork and not have it take all day like it would in a crockpot. My favorite recipes are found on Dad Cooks Dinner and Pressure Cooking Today. Oh, I’ve also made great cheesecakes in the IP. They were something I used to be intimated by. I’ll be taking my IP with me on spring break next week! You’ve got it easy. There are recipes EVERYWHERE specific for the Instant Pot. My hubby got me a Farberware pressure cooker for Christmas, there are no recipes online for it, the directions are horrible, and the buttons are weird. I have figured out how to make some stuff in it, but I’m not sure how I would make something like these eggs. I’ve got a Faberware too, and all the instant pot recipes work fine with it. 🙂 No worries! Is the pot dishwasher safe? I haven’t tried one yet. Can you make jam (in jars) in it? No, you cannot can in this. it’s a pressure cooker, not a canner. The pressure or heat (can’t remember the element) isn’t stable enough to guarantee a safe seal in jars. Crystal, thanks so much for this post! I bought my IP on Black Friday too and saved it for a few months because I was too busy through the holidays and was scared of it like you. It seemed like a great deal to learn. I’ve finally tried a few things and so far my favorite is your crockpot refried beans. It cooks them so fast! I haven’t tried the boiled eggs yet but I will. I’m still afraid of mine lol All I’ve done is the water test twice (I don’t think I did it right the first time). I may try eggs tonight, we’ll see. Glad to see that I was not the only one intimidated by all the buttons. Woohoo! You can do it!! I’m so glad you pushed past the initial intimidation-this is a great tool-will save time & encourage you to cook instead of eat out. There are so many safety features that the only real danger is- like you said- the steam out of the vent. I use a wooden spoon and sometimes throw a paper towel over the steam vent to contain the liquid on cabinets. my favorite uses- corn on the cob (OMG), rice, SOUPS!!! beef tips were amazing, sweet potatoes and yesterday finally tried eggs -wow! SO much easier to peel!! have fun! Thanks so much for sharing the top about a paper towel over the vent! So good to know! I am still surprised at how tender stew meat comes out, as well as chicken breasts. I make a soup in it every Sunday on a timer so it’s ready when we get home from church. But my FAVORITE thing so far are these gyros! I didn’t even know I liked gyros! You could eat them without the pita bread to adjust to your dietary needs, but I recommend that an exception be made to include the greek yogurt in the cucumber dressing, because it’s soooo so good. I have been on the fence about buying an IP. I know several girls at work who have them and love them but I have to admit I’m a little afraid of blowing myself to bits lol! Thank You for this post and I look forward to more “hand holding” I think I might have to pick one up the next time a see a good deal on them. I got mine on Black Friday also and used it just as a slow cooker for the first week or so. But then I got brave and have now made meatloaf, chicken broth and chicken noodle soup (on the same day), green beans, chili, cooked dry beans in an hour, and made homemade sour cream and yogurt. I love mine and used it several times a week. It makes so many dishes into a one pot meal and clean up is a breeze. I’ve gotten all my friends at church wanting one! Got mine on black friday too and guess what – just opened it last week! 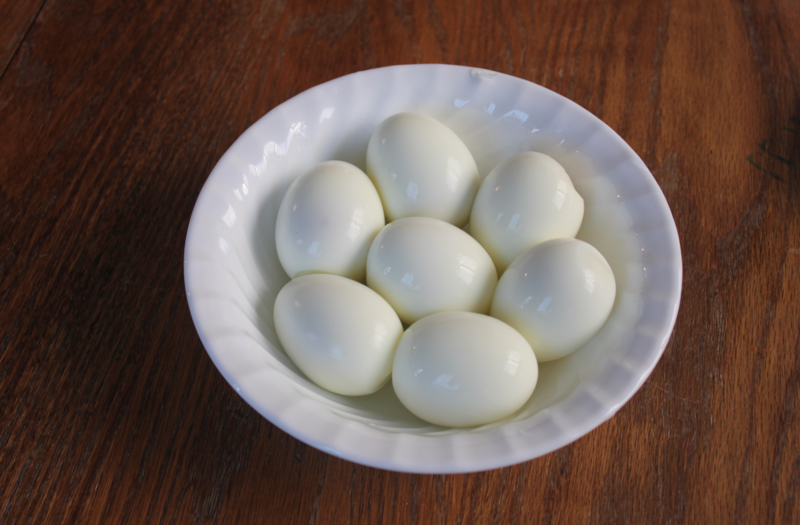 I too made hard boiled eggs but must have left them in too long (some recipes were 6-8 mins and leave them in for that long) b/c the bottom of the pot burnt and so did some of the eggs. But they still peeled great and most were saved so I will try again! Esp. with Easter coming. So intimidating and I don’t have a lot of time to really see what I can do but will keep at it. I finally ended up getting an Instant Pot after my husband insisted on it. The first month that we used it, we went more than $100 UNDER budget on our groceries, so obviously we recouped the cost of the machine right away. I find it very easy to use and use it almost daily. We are vegetarian and I used to have the problem that I hadn’t planned ahead to soak beans. Now we don’t have that problem anymore. Cooking beans couldn’t be any easier, just rinse them, cover them with water, shut and seal the lid, and turn them on manual cook for the specified amount of time. I use dried beans a lot more and I find that cooking economically is just so much easier. Even if I haven’t planned ahead, I can whip something healthy up quickly, without standing over it and baby sitting it. I also love cooking soup and boiling potatoes in it. I save veggie scraps and make my own homemade vegetable broth. So easy to make economical healthy meals. For anyone trying to save time or money or eat healthier, I highly recommend it!